Weekly recap time, using #creativedaily photos! Also some adjustments to the blog schedule, after the recap. Time to look back at the week through #creativedaily photos! Not a lot of pictures of what I've been working on this week because there has been so much computer work! I've got some fun pictures though, like my giant shelf of plushies! Weekly re-cap time! Here is the latest happenings around here with photos from #creativedaily prompts! Time for the weekly recap of what has been going on here in Squshie land. Let's' start this weekly recap off with a picture of Hazel! She hasn't made a blog appearance in a while. Cute sleepy Hazel. Now on to the #creativedaily photos! Time for another weekly round up of Creative Daily photos! Before we get to that, here is a look at what my week has mostly looked like. Monkey doodle on one computer monitor, and reference pictures of monkeys on the other. I've been working my way through all the doodles, turning the sketches into patterns. Getting closer. There are only 8 monkeys still in doodle form and there are about 8 monkeys at the ready to be cut out phase! Less than 2 weeks until DesignerCon! This event is happening at the Pasadena Convention Center, November 9th and 10th. If you are in the area come say hi! It is a really fun show to check out. 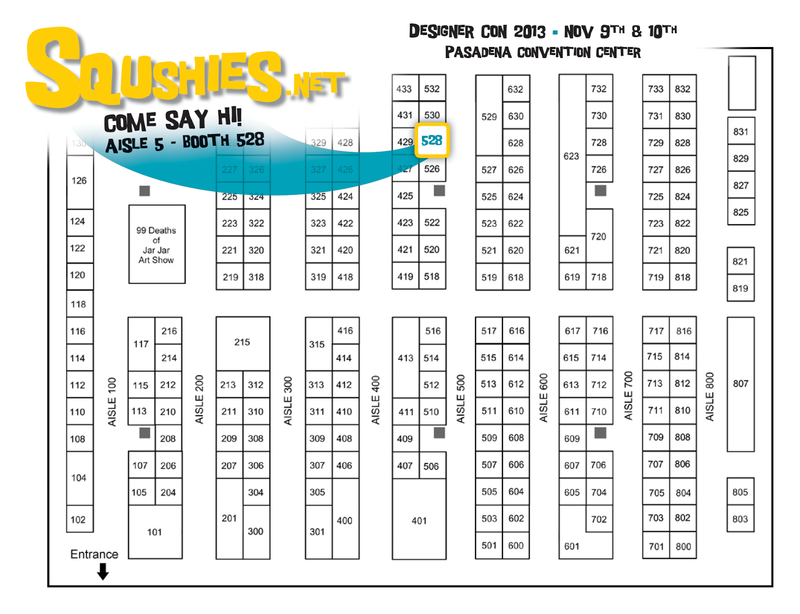 We'll be at booth 528. Felt Animal Making Week In Review! Been a long time since I did a week in review post! They seemed to be getting a bit boring and repetitive so they just didn't seem very fun for anyone. Well this month I'm trying to do the #fmsphotoaday challenge. I've been posting my pictures on Instagram, Twitter, and sometimes on Facebook. I realized they are kind of like mini blog posts for each day, but with a different prompt each day it is a bit more fun than my usual 'I sewed this today'. Here's my first week of photos!